In many ways, chapter 8 is the high point of the book and in the history of Israel as a whole. What would we expect to happen next after that thrilling encounter with God? The mountaintop is often followed by the pits of despair. The people acknowledge they are sinful like every generation before them. God is faithful, while they are faithless. Chapter 1: Nehemiah is caught in the tension of two worlds: cup bearer to the king and brother to the exiles. Chapter 2: Nehemiah faces three moments where he must rely on the word of God and speak out boldly. Chapter 4: details the opposition the builders faced, including primarily their own internal ridicule, defeat and shattered faith. Nehemiah provides an example of a godly leader by speaking God about the people and to the people about God. He taught both to trust and to fight. Chapter 5: records the problems the community was having internally. Nehemiah rebukes them for their actions and calls them back to fearing God. Chapter 6: Nehemiah faces 3 tests of his character, as his enemies seek to kill him by appealing to his desire to be appreciated, his ambitions and his fears. In each case he resists because he knows that God is fighting for him and he does not have to put himself first or place too much importance on himself. Chapter 7-8: We learn that the city is has been rebuilt, but is not alive. Having been used by God, the people now long to know God. Then ask Ezra to teach them the Bible, so that they might know and understand their God. Understanding the word of God produces a great grief over their sin, but also a tremendous joy over their salvation. They end the section by celebrating the feast of tabernacles and realizing that this earthly city is not their home. In many ways, chapter 8 is the high point of the book and in the history of Israel as a whole. For many of us, what happens after a mountain-top experience of the presence of God generally is a valley. Nehemiah’s people expect the same. 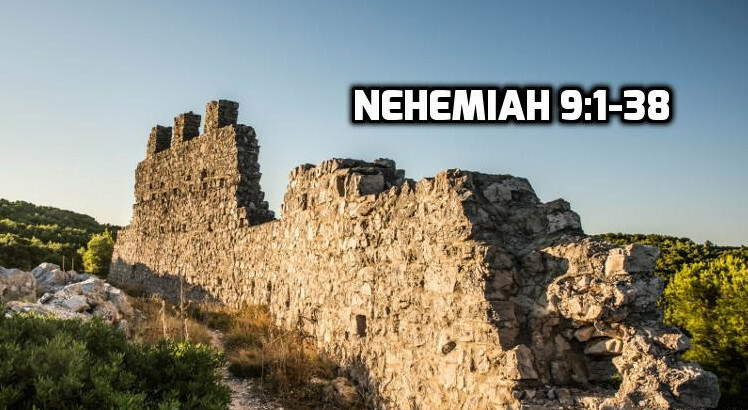 Nehemiah 9 records the longest prayer in the Bible outside of the Psalms. It’s about sin, struggles, God’s faithfulness, our faithlessness, and the longing to know how to finish the course, to get through the valleys and depths and the failures. The key theme in this prayer: They confessed not only their own sins, but the wickedness of their fathers (Nehemiah 9:2). If all the generations prior to you have been people who eventually rejected the Lord, what is the likelihood that your generation is going to be different? Nehemiah 9:6-15 focus on God as Creator and Savior. The history retold in this section covers the Creation, the calling of Abram and the redemption from slavery in Egypt. The striking grammatical feature is the repetition of “You” (speaking of God) throughout the section. Nehemiah 9:16-25 focus on God’s character as generous and patient. The history retold in this section covers the wandering in the wilderness and the conquering of the promised land. The striking grammatical feature is the repetition is the alternation of “they” and “you”. Our actions and God’s are set up in sharp contrast. Nehemiah 9:26-31 focus on God’s warning, disciplining & and rescuing his people. The history retold in this section covers the judges, the monarchy and the exile. This cycle is repeated throughout this section. They were disobedient, you handed them over to their enemies, they cried out to you, you rescued them. Then they turned around and started the rebellion all over again. Nehemiah 9:32-37 is their conclusion or summary of the prayer. The main point here is God is faithful but we are faithless, as stated in 9:33. We do well to observe that this is a prayer. The leaders of Israel turned toward God in hope rather than away from him in shame. God is not to blame for our struggle with sin. God is attentive and he cares.